It’s actually simple, right? Just put the guitarist in a room with good acoustics, put a mic 8″–16″ over the fingerboard and aim it just above the 15th fret (see Figure 1), and you’re ready to roll. But, as usual, there are subtleties, and that’s why we’re gathered together today. Here’s a stream-of-consciousness look at recording this fundamental and wondrous, yet elusive, instrument. The first step in recording a good acoustic guitar track is to make sure the guitar makes sounds that are worth recording. At the risk of repeating myself (I mentioned this in the last segment of my “First Steps” series in December 2016), you probably shouldn’t put on new strings at the start of the session; new strings hold their pitch well, yes, but on acoustic guitars they also ring and rattle like nobody’s business. If you change your strings 24–48 hours before you’re planning to record, they’ll have a chance to settle in and calm down. You routinely use a humidifier in your case or inside the guitar, right? Unless you live in a climate with consistently high relative humidity (and never use an air conditioner or forced-air heating at home! ), your guitar spends much of its time in a dry environment, and its tone suffers—the bass goes away, and the action gets troublesome. I routinely use a Dampit® humidifier, a piece of rubber tubing that contains a hunk of surgical sponge; you soak it for about 10 minutes, wring it out, and put it into the guitar’s soundhole. (Some people keep a slice of apple in their guitar case as a humidifier; it smells nice, but can attract ants.) If you’re not using a humidifier routinely, at least use one the night before you record; the tonal dividend can be remarkable. I’m assuming your guitar is set up properly: no fret buzzes or rattles, comfortable action all over the neck, good intonation. If not, get thee to the town’s best guitar fixer and make it right. Now that the guitar sounds its best, what are you planning to record? 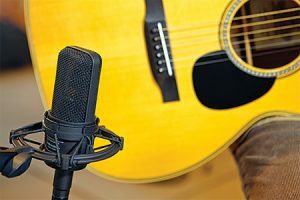 There are four major categories into which an acoustic guitar recording may fall, and some of them need specialized recording techniques. Solo/twin guitar. Solo is self-explanatory, but the techniques used for recording guitar solos also apply when there are twin guitars interacting—the classic example being the longtime partnership between Doc and Merle Watson. songwriter recording without a backup band. This may not work with the same setup as the solo/dual guitar recording if the musician sings and plays at the same time, since now leakage issues present themselves. If you play the guitar part first, then overdub the voice, obviously leakage isn’t an issue. Guitar as an element in a dense mix. This is a whole ’nother ball game; when the guitar is part of a large ensemble (whether live or overdubbed), it’s usually not recorded/mixed full-range. Usually the ensemble includes a bass instrument that takes care of the nether frequencies, so the acoustic’s low end gets chopped off to some degree. Obviously, there are intermediate or hybrid situations. One classic example is Elvis Presley’s famous Sun recording of “That’s All Right, Mama”, where the guitar is certainly accompanying a singer, but in the presence of a small group (electric guitar and bass fiddle). There, the engineer (Sam Phillips) rolled off the bottom of the guitar’s sound to avoid having the guitar’s lower frequencies overlap the bass. Which mic you choose for the task depends to some extent on the scenario you’re working in, although not as much as one might think. Guitars have a lot of bottom (particularly larger guitars, like dreadnoughts), and directional mics—cardioid, hypercardioid and figure-8—have proximity effect. That acts like an EQ which boosts the bass when the mic is close to the sound source. Even for a solo guitar recording, you probably don’t want that; you want full-range sound, yes, but not a boombox. That’s where the 15th-fret position I mentioned above comes in; on most guitars, in most situations, you don’t want to fall into the hole. Some people think that the soundhole is the place to put a mic because “it’s where the sound comes out.” But that isn’t really true; most of the sound from an acoustic guitar comes from the vibration of the top, with the strings themselves contributing a small amount (their main job is to set the top in motion). The hollow body of the guitar forms a resonator, which boosts the bass frequencies to a lesser or greater degree, depending on the body size. The hole helps tune this resonator, and what comes out of it is not the wide range of the instrument’s sound, but a spectrum centered around the note to which the resonator is tuned. This one-note sound is sometimes called “jukebox bass”, and while the strong bass can help the instrument carry in a bluegrass jam session (that’s why the Martin D-18 has become the quintessential “bluegrasser’s guitar”), it can interact with the microphone’s proximity effect to produce the dreaded one-note boom. One solution, if leakage from other instruments or voice isn’t an issue, is to record the guitar using an omnidirectional mic, which has no proximity effect. Even so, keep the mic away from the hole. So back to my question: which microphone to use on that 15th fret (which is away from the soundhole)? What you don’t want is a mic with a shrieking high end. I read a recent review describing a mic with a rising response through its range, culminating in a +12 dB peak in the treble. Yes, +12 dB; that’s not a mic you want recording an acoustic guitar, as it will sound thin and wiry, and exaggerate pick and fret noises like nobody’s business. Even in Scenario 4, the small-element-in-a-big-mix recording, a mic with such an exaggerated response won’t produce good results. In class a few weeks ago we did a mic shootout between some mics renowned for their ability to record acoustic guitar. We were using a not-particularly-fancy plywood-topped guitar; when the student brought it out and started playing, we were all pleasantly surprised by its tonal excellence. Cheap guitars have gotten a lot better in the last 20 years! We didn’t have a chance to make the shootout comprehensive or scientific; we only had the chance to try a few mics. The students’ favorites (and mine) were the ones I predicted: the AKG C451B small-diaphragm condenser, and the Microtech Gefell M930, which has a large diaphragm but a small body size. Interestingly enough, the published frequency response curves on these mics are surprisingly similar (Figs. 2 & 3—our thanks to AKG and Microtech Gefell for permission to reprint these). If you prefer a flatter frequency response on acoustic guitar, two good alternatives are the Shure SM81 and the Oktava MK012. The Oktava has interchangeable capsules that include cardioid and hypercardioid pickup patterns… and therein lies a tale. Way back in the Paleolithic Era I recorded a musician named Bob Abrams in a Scenario 2 setup—guitar and vocal. I had eight tracks available for the recording, and I decided to try a trick I’d read about: putting a large-diaphragm Neumann U 87 on the guitar, with a couple of small-diaphragm Neumann KM 84s flanking it. Everything sounded fine, right up until Bob launched into some blues shouting. When it came time to mix these songs, I discovered that Bob’s voice had leaked into the U 87, and the leakage sounded terrible. He was seriously off-axis, and many large-diaphragm mics have squirrelly response off axis. (The M930 and TLM 102 don’t, but they hadn’t yet been introduced at the time.) The leakage into the small-diaphragm KM 84s, however, didn’t sound bad; their response off-axis is pretty uncolored. KM 84s, however, have an odd interaction with large-bodied Martin guitars; they “woof out” at the bottom. I suspect that this is a combination of proximity effect and saturation of their minuscule output transformers; whatever the cause, it doesn’t go away with EQ. Fortunately it wasn’t too obtrusive on this session, but would have been nice to avoid altogether. The nice thing about Oktava MK012 microphones, however, is that they’re transformerless, and they don’t woof out. For recording a Scenario 2 (guitar+voice) or Scenario 3 (small-group) combination, I might use an MK012 with its hypercardioid capsule; that allows a little bit of leakage from the voice, but less than the cardioid capsule, and the off-axis response is still nicely uncolored. The hypercardioid capsule has more proximity effect than the cardioid, but a 100 Hz rolloff will usually cure that. If you’re looking for Oktava MK012s, by the way, you need to get them from the official distributor (oktava.com). I mention that because there was a rash of MK012s on the market about 10 years ago that had failed to meet specs, and they were followed by knockoffs that weren’t really Oktavas. Go to the official source and save yourself some heartache. What about Scenario 4, the dense mix? I’d actually choose the same mic I’d use for the other setups, making sure not to use one that woofs out or screeches. A little gentle boost in mixdown around 10 kHz (no more than a couple of dB) plus a steep rolloff of the lows should make it fit in nicely. I’ve only mentioned a few mics above. What about some others? In an article I wrote for Recording several years ago, I touted the Neumann KM 84 (hero of my session with Bob Abrams). Unfortunately, the KM 84 is long gone, and its successor (the KM 184) is a very different-sounding microphone; though I’ve liked the KM 184 on flutes and mandolins, I haven’t had much luck using it on acoustic guitars. The KM 84 occasionally shows up on Ebay, though, and deserves mention here. I’ve had excellent results using it on Taylor and Gibson acoustic guitars; it seems to get along less well with Martins and their imitators, as it tends to woof out on them. What about the venerable Neumann U 87, which I also lauded in that long-ago article? When you’re recording solo or duo guitars, without a singer, it can do a splendid job on an acoustic guitar—the U 87 has an unusual liquid quality that imposes itself over the guitar’s tone. It’s a very 1970s sound. Unfortunately, the U 87 now sells for about $2400, not including shockmounts. Somewhere along the road, I had the pleasure of reviewing the Sennheiser MKH40, a small-diaphragm condenser mic. My memory of using it on acoustic guitar is that it had a unique ability to draw the listener’s attention. When it was on a guitar (say, in a small ensemble) you had to listen; the instrument just wouldn’t stay in the background foliage. That might be what you’re looking for or it might not, but in the right context it can be an enormously attractive sound. The MKH40 costs about $1200, the same as the Gefell M930. One alternative available for recording acoustic guitar in Scenarios 1 and 2 (solo/duo guitars, with or without a singer) is to mic the guitar in stereo. One way to do this on a solo guitar is to point two mics at the instrument’s body—one on the usual 15th fret, the other down by the bridge—panning them hard-right and hard-left respectively. This can produce a “bigger-than-life” guitar sound that spans a listener’s speakers—sort of like a 10′ acoustic guitar body. I’ve done this a few times; Julie Henigan’s album American Stranger has several examples. On that recording, I think I was using Shure SM81s on the guitar. When vocals leak into these mics from the side, their response is basically flat with a rolled-off treble. The hazard in recording guitar with two parallel mics is that most guitarists move around a little when they play. (Julie doesn’t, luckily for me.) 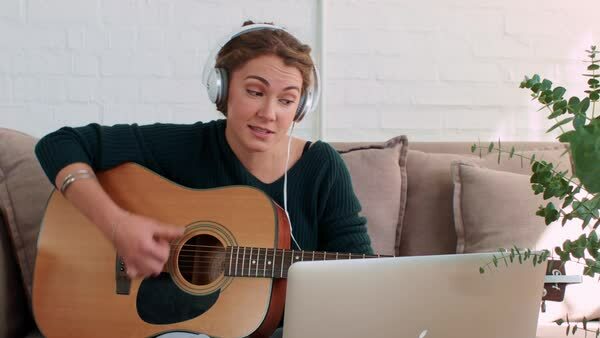 This changes the relative distances of the two mics, and two things can happen: first, the image of the guitar can shift drastically in the speakers, sounding like the guitarist just jumped across the room. The other problem that can develop from the guitarist’s motion is comb filtering. 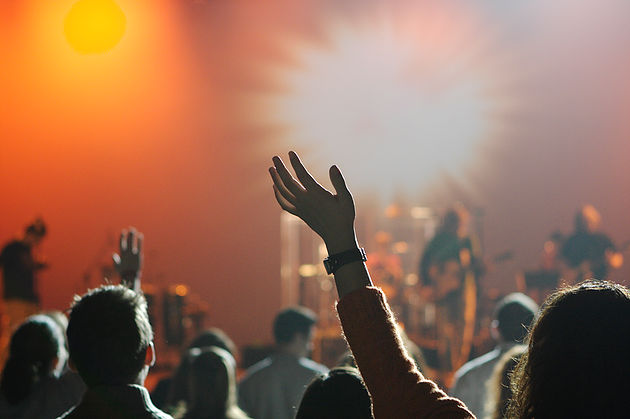 If he or she twists the guitar so that it’s closer to one microphone than the other, cancellations and reinforcements will happen in the high frequencies—a 1″ difference in guitar-to-mic distances will produce a cancellation at 6.8 kHz and a reinforcement at 13.6 kHz. For recording an acoustic guitar in stereo, therefore, I prefer to use an XY arrangement, using two cardioid mics (usually small-diaphragm) nose-to-nose, with their capsules angled at 110° and stacked one above the other (see Figure 4), and the whole assembly sitting—where else/—above the 15th fret. The sound clip that goes with this article (downloadable from https://is.gd/RECJuly2017AcGuitarExample), used by permission of the artist, Phil Cooper, is one of my favorite acoustic guitar recordings. Phil was playing a small-bodied Breedlove C2 guitar, and I put an XY pair of cardioid Oktava MK012s over the 15th fret, panning them hard left and hard right. I think I rolled the bass off at 100 Hz to compensate for proximity effect, but there was no other EQ or processing used. Can you do this when someone is singing? Yes, if you’re careful. If Phil had been singing on this track, I might have used the hypercardioid capsules on the MK012s; XY works with hypercardioids if you change the angle to 90°. And here’s something that might only work with Phil Cooper’s voice: I used to record him with an XY pair of KM 84s or MK012s at neck level (his neck, not the guitar’s), and I could change the mix of guitar and vocal by adjusting the mics’ angle. I did need to use a pop filter when I did that, as most small diaphragm condenser mics are inordinately sensitive to p-pops. The guitar was off-axis, but on the KM 84s and MK012s I was using, it actually sounded good that way… so much so that I occasionally recorded Phil’s guitar with the mics in that position even when he wasn’t singing. The quality of your mic preamp matters a lot on acoustic guitar recordings. If the preamp is thin-sounding, or one-dimensional (flattening everything out until it sounds like a cardboard cutout), or hard and shrill in the high frequencies (the telltale clue is exaggerated pick and fret noise), your recordings of acoustic guitar will suffer for it. I can’t emphasize this too strongly; too many low-priced interfaces include cheap mic preamps that won’t do an acoustic guitar justice. If you have a separate mic preamp, and can patch it more directly into the A/D converter, your acoustic guitar recordings can gain a great deal of depth, three-dimensionality and realism. Some interfaces have insert jacks; they’re worth their weight in gold at times like this. Other manufacturers are putting better preamps into their interfaces—see, for example, Paul Vnuk’s June 2017 review of the Antelope Goliath. That’s good news for everyone, but especially for guitar players. Even if the recording’s destiny is to have its bottom chopped off for incorporation into a complex mix, you can make a track that fits more effortlessly if the preamp is good. What about pickups? They used to be anathema for serious recordists; magnetic pickups made your acoustic guitar sound like a pawnshop-special electric, while piezo pickups often had a characteristic timbre that received the moniker “squacky”—if you’ve ever watched “Austin City Limits” you’ve heard it. Well, pickups got better, and more important, the preamps used with them got better. It turns out that pickups (all pickups, not just piezos) really prefer to operate into a really high impedance, like 10 MΩ or more… that’s 10 million ohms. Preamps with input impedances like that used to be rare birds, but now they’re more common, and the “instrument” inputs on some interfaces have sufficiently high impedances too. The singer-songwriter and virtuoso guitarist Joel Mabus has, for his last several CDs, blended a track from his pickup (via a good preamp) with the microphones on his guitar. The result adds just a little edge to the sound, in an engaging way. Check out the guitar sounds on his latest, a gospel record called Different Hymnals, for some examples. The acoustic guitar is its own universe; listen to a recording by John Renbourn, or John Fahey, or Joel Mabus, or Doc & Merle Watson—listen deeply, until you get lost in the sound. Acoustic guitars are like that; their sound is endlessly complex and fascinating. A certain renowned guitar player once said in an interview that he thought the sound of an acoustic guitar had much more variety and depth than that of an electric guitar, and was just plain “more interesting.” This purist rock-hating retro-folkie was named Keith Richards. If Keith thinks the acoustic guitar has the most possibilities, who am I to argue? In any case, I hope this article will help you to record the acoustic guitar more richly, capturing the interest that Keith (and all of us) love. Enjoy! Paul J. Stamler is an audio engineer, educator, musician, and collector of vintage and historical audio recordings, living and working in St. Louis.